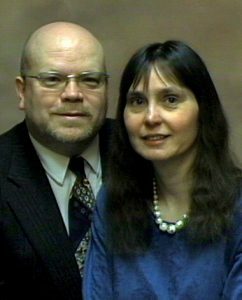 Pastor Harold began his ministry at Calvary Community Church in June of 2012. In his preaching he expounds on the Word of God with a fiery, rich anointing of the Holy Spirit. He also routinely functions in the prophetic. He has a genuine shepherd’s heart for those he pastors. During his thirty-six years of ministry he has pastored six churches in Ontario (including Calvary) and been involved with his family in a evangelistic traveling ministry ministering in many different denominations, fellowships, ethnic churches and Camp Meetings. His wife of 30 years, Cheryl, works alongside him giving direction to the children’s and women’s ministries at Calvary. They have three adult children. Ethan is the ChildCARE Plus Administrator for Prem Sewa Shikshan Sangh in Nagpur, India. Aden assists with the music ministry at Calvary playing bass and leading worship once a month. He is also part of our Genesis Youth Leadership Team. Alyssa and her husband Anthony are involved in ministry in another church in Windsor, Ontario.